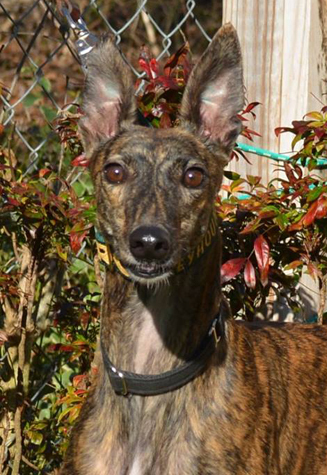 Chrissy is a tiny 45lb brindle female greyhound that arrived with her sister Janet from the Roban Farm in Florida. She is one of the very tiniest greyhounds we have ever placed. Her sister Janet was the same size and has already been placed. Chrissy is a young pup that just turned 2 on March 2nd. She just didn't show much interest in chasing the lure so retired before ever making it to the race track. Her sire is M's Free Mason and her dam is M's Free Action. Chrissy is very shy, what we call a spook. Spooks are genetically shy dogs that seem to have an anxiety disorder that causes them to be afraid of anything new.This type of behavior is not related to abuse and Chrissy came from a very nice farm and was treated very well. This is just her personality so it isn't something that is going to just go away in a month or two with attention and love. Chrissy just shies away or runs away from things she is afraid of and has never shown any inclination to defend herself. She will warm up to her owners and be comfortable in her new home eventually, but it will take a long time, months to a year. She is likely to always be afraid of strangers and terrified outside of her own home, so is going to prefer to be a homebody. Chrissy gets along well with other dogs and would do best in a home with a more confident dog that she could follow. Because she is so jumpy, Chrissy is going to be afraid of fast moving, loud little children and would do better with calm, older children or in a home with no children. She will need a very patient family that will love her as she is and give her the time she needs to trust them and get comfortable. Chrissy has been in a foster care for over 5 months waiting on someone to adopt her. She has warmed up to her foster dad with time and encouragement and now sleeps on the bed with him. Chrissy snuggles with him on the couch and does a cute playful bark at dinner time to remind him to feed her. She initiates play now and brings him toys, but it took months to get to that point. Spooks are so rewarding when they do finally come around. They become very bonded to their family once they trust them. If you want a very tiny girl and are willing to give Chrissy time to love you, she will be a very devoted girl and good pet.